Google Alerts are email updates of the latest Google results based on a “search term”. For example, I have a Google Alert set up for “Writer’s Residence” and get an email whenever a blog or website mentions that phrase. Here’s how to do it: Go to Google.com/alerts and create an alert for “Your name” Site:website.com. For instance, I could set up an alert for Experience.com by typing “Susan Johnston” site:Experience.com. Then, once I find a new article I’ve written, I bookmark it in Delicious for future reference. Writing samples, or “clips”, are a critical part of the writer’s marketing machine. They demonstrate to editors proof of your abilities and should be included with all queries and pitches unless otherwise noted in the publication’s guidelines. This may sound simple enough, but it’s not always clear what qualifies as a “sample” or how to send that sample in an email query. In this article, I attempt to demystify writing samples by defining what they are, how to format them, and how to send them with an email query. What is a Writing Sample? In some cases, unpublished material can also be used as a sample if you haven’t been published before. So you have a newspaper clipping in one hand, a blog post in the other, and a magazine article dangling off your big toe. How do you put this hodge podge together into a tight package that won’t give editors a headache? I am a full-time writer with numerous online and print credits, including The Daily Telegraph, The Hackney Citizen, and SmarterFitter.com. You can read samples of my work at at http://monicashaw.com. 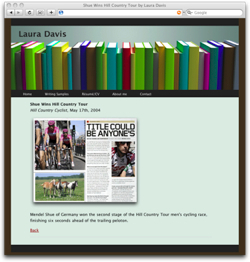 Alternatively, you can include links to individual writing samples that are targeted to the publication. Many editors will delete attachments unread because of the risk of viruses, and many spam filters will toss them out before an editor even has the option of making that decision. I can’t emphasize this point enough; I’m amazed by the number of writers who continue to ignore this advice and have their queries deleted because of it. All of your writing samples should be hosted on their own web page and include the sample title, name of the publication, and date it was published. Newspaper and Magazine Clippings: First, scan your clipping as a high-resolution jpeg file. Then create a web page that includes a smaller, thumbnail image of the clipping, plus a link to an image of the full-resolution scan OR to the full text article on the publication’s website (click here to see an example). Documents: Documents are risky because you can’t be sure the editor will have the right software to read it. So if you must contain your writing sample in a document, make sure it’s in a standard format such as Word (.doc), text (.txt) or PDF (.pdf). As with all writing samples, host your document on its own web page that clearly displays the title, publication and publication date. It’s also a good idea to include some text that summarizes what your sample is all about (click here to see an example). Blog posts: If copyright issues prevent you from including the full text of the post in your portfolio, then include a link to the original blog post. As with documents, it’s also good to include some text that summarizes the post. Health and fitness writing is a booming market and great place for freelancers to strut their stuff. This post contains an overview a few health and fitness magazine that welcome freelance submissions. Who they want: Journalists and freelancer writers with a track record of published magazine and/or newspaper articles, books etc. Payment: Fees vary according to the type of piece and the amount of reporting or research required. How to pitch: Common Ground asks for a short 1-2 paragraph précis of your article ideas and a brief bio. If you have published clips, send no more than one or two samples, or refer them to a website where they can review them. Submit pitches by e-mail or snail mail. Description: EatingWell is a U.S. bimonthly food magazine that focuses exclusively on eating healthfully. Their readers are interested in cooking and nutrition science, the origins of food and social issues related to food networks. Their voice is “journalistic and authoritative” and covers nutrition with a “newsy, science-based approach”. What they want: Articles for their front-of-book sections on food and nutrition – seasonal picks, trends in nutrition/health, food culture, and timely nutrition topics with a service-based slant. Read the guidelines for details on freelancer-friendly columns. Who they want: EatingWell welcomes new writers for their front-of-book sections. They also accept food/culture-based travel stories and food stories from established writers. New writers should start off pitching front-of-book ideas. They prefer pitches via e-mail. Describe your idea in two-to three paragraphs. Be sure to explain “why now” and where the story fits in the magazine. Share a few sentences about your experience. Do not attach clips; sell them with a great pitch. How to pitch: Read the guidelines for the appropriate editor. What they want: Feature and department articles. Payment will be determined on a per-article basis based on the research requirements and story length, as well as the proven experience of the contributor. Her Sports buys all North American serial rights, and payment is made on publication. General fees range from $150 to $450. How to pitch: Query letters via e-mail are preferred. Send queries to editorial@hersports.com. Sacramento Fit Magazine (SFM) is a health and fitness magazine covering the Sacramento Metropolitan area for people who crave an active and healthy life. SFM covers topics on nutrition, fitness training, healthy living, local athletes, regional sporting events, product reviews, the latest gear, as well as a comprehensive calendar of local activities and events. Published bi-monthly, SFM also features regular articles dedicated to Sacramento style and life, because being fit means more than just working out, it means feeling and looking your best. Payment: $250 for feature articles and $50 for department articles. Description: Yoga Journal covers the practice and philosophy of yoga. What they want: Queries on the following themes: leaders, spokespersons, and visionaries in the yoga community; the practice of hatha yoga; applications of yoga to everyday life; hatha yoga anatomy, kinesiology, and therapeutic yoga; nutrition and diet, cooking, and natural skin and body care. Payment: Payment varies, depending on length, depth of research, etc. How to pitch: E-mail queries to queries@yogajournal.com. Can Writers be Purple Cows? I just finished reading the book Purple Cow by Seth Godin. Seth argues that the only way to sell a product in today’s overcrowded marketplace is to create something truly remarkable. My goal in Purple Cow is to make it clear that it’s safer to be risky –to fortify your desire to do truly amazing things. Once you see that the old ways have nowhere to go but down, it becomes even more imperative to create things worth talking about. I recently reviewed his book on SmarterFitter, where I wrote that many Purple Cow ideas can also be applied to health and fitness. Strangely, I’m having a harder time applying these rules to freelance writing, an actual business! Can writers be Purple Cows? In the freelance world, it seems difficult, especially for new writers. Can we really afford to pass up paying jobs waiting for something remarkable to come along? Or is the whole concept of “remarkable” simply relative to the competition? Seth actually discusses how Purple Cow thinking applies to freelance writers on his blog. He writes about “Bradley”, a freelance writer, who told Seth that Purple Cow thinking didn’t apply to his profession because all of his clients want average work. In response, Seth observed that there are loads writers out there who seem to get paid way too much for the effort they put in. How do these writers get those gigs? It’s because they stand for something. Because they are at the edges. Because if an editor wants a ‘Bob-Jones-type’ article, she has to call Bob Jones for it… and pay Bob’s fees. Bob would fail if he did average work for average editors just to make a living. But by turning down the average stuff and insisting on standing for something on the edge, he profits. By challenging his clients to run stuff that makes them nervous (and then having them discover that it’s great), he profits. This is scary. It’s really scary to turn down most (the average) of what comes your way and hold out for the remarkable opportunities. Scary to quit your job at an average company doing average work just because you know that if you stay, you’ll end up just like them. Scary to go way out on an edge and intentionally make what you do unattractive to some. Which is why it’s such a great opportunity. Interestingly, other commenters point out that simple professionalism is rare enough in the writing world that simply adhering to deadlines and running spell-check is enough to be considered “remarkable”. I can’t argue with the importance of professionalism, but I do wonder how practical it is to be “ultra-specialized”, especially for new writers. At the moment, I spend about half my time writing for a client who isn’t in my target area of specialization, but who does send me a paycheck every month. I spend the other half chasing my specialty – pitching ideas, research, and occasionally writing an article or two. But it’s slow going and I can’t afford to give it my all. Where do you draw the line between being a Purple Cow and making enough money to pay the bills? Is it possible to have both, even early in a writing career? We perform routine maintenance and upgrades weekly on Saturday mornings between 7am and 8am London time (GMT+1 at the moment). Today’s upgrade took 5 minutes. Future upgrades should take about the same time, all going well, but it is good to have some headroom on changes like these. Thanks for your patience, we want to keep making the site better for you. Tim and I have had a busy week! We’re delighted to see how many new people have signed up to try Writer’s Residence but we’ve noticed that some of you folks were having a little trouble getting your websites off the ground. So we decided to put in some extra help features to hopefully make it even easier to set up your online writing portfolios. When you sign in to Writer’s Residence, you’ll now see a checklist on the dashboard that contains a list of all the things you can do with your website. We listed things in the order that we think makes the most sense, but you can certainly do things in any order you wish. The management screens now contain a few extra tips and suggestions to help you fill in the required information. Once you get the idea, simply click the upper right hand corner of the box to close it forever. We’ve also added some extra notifications and links to reassure you that your changes have been saved and to make it easier to see your changes. We’ve integrated the website address process into the sign up page so that customers choose their website address when signing up. From now on you’ll always have an address like http://monicashaw.writersresidence.com, you can also set up your own domain name like http://monicashaw.com. In addition to the site changes, we’ve also changed our UK support telephone number and added a USA number. Give us a call if you need any help! Or send an email to support@writersresidence.com.